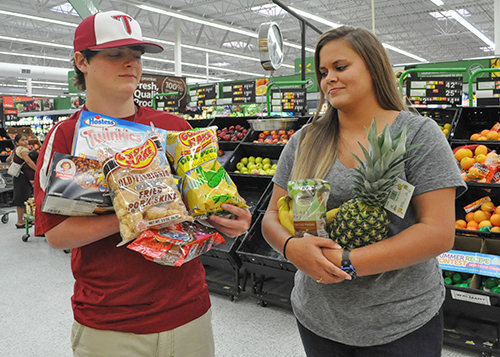 Facts that students learn in Troy University’s online nutrition courses can dispel myths, according to Dr. Teresa Johnson, associate professor of kinesiology and health promotion. Johnson heads the nutrition minor, which is offered exclusively through eTroy. She encourages any student to sign up for classes, whether or not the student wants to complete the whole minor. This minor, or any of these classes standing alone, is a great complement to people wanting to work in fields such as health professions, hospitality management and human sciences, she said—or even just students wanting to know more about nutrition in general. She also said these classes are relevant to all college students. Kinesiology 2211, human nutrition, requires no prerequisites and can give anyone a good look into what nutrition is from an unbiased perspective, she said. Once human nutrition has been taken, any other nutrition course may be taken as a standalone course. The other classes in the minor are introduction to food science, introduction to food science lab, nutritional assessment, complementary and alternative therapies, community nutrition and lifecycle nutrition. “I am excited that nutrition classes are becoming available as an option,” said Corinne Jacobs, a freshman athletic training major from Auburn. Anyone wanting to know more about the nutrition minor or nutrition in general can contact Johnson at 112 Wright Hall or tjohnson@troy.edu.